I wasn’t able to directly participate but I had my own mini-hackathon as well. But, rather than focusing on another boring piece of legislation that nobody wants to read, I thought I would have a little fun with it. If you know me, you’ll know that I’m a huge fan of The Big Bang Theory television show. You could say I have a few Sheldon-like tendencies of my own. 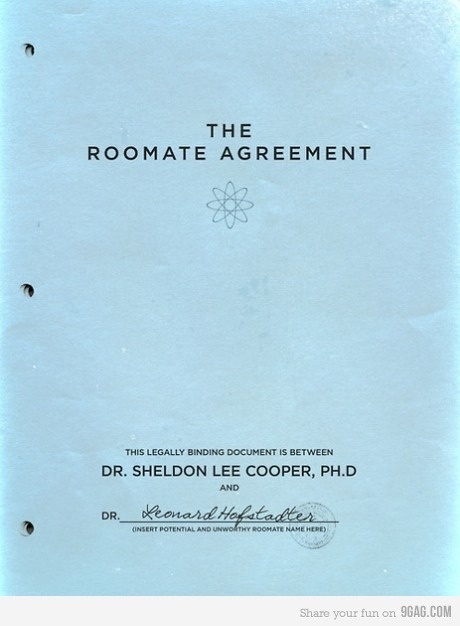 I’ve often thought that the complex roommate agreement that Sheldon had Leonard sign would make a great example for a legal document modeled in Akoma Ntoso. Of course, it’s not a piece of legislation, but surprisingly, it has many of the attributes of legislation. It is even, much like legislation, a bit of a chaotic mess. I had to make a number of extrapolations or “fixes” in order to get a reasonably consistent and workable document. I sure hope, if Sheldon’s desire to win a Nobel prize in physics is to be realized, that he is a better theoretical physicist than he is a legal drafter. Perhaps we should offer to give him a few pointers in document theory and the logical organization of ideas – he really needs them. In article 10, section 9, there is an example of conditional effectivity. The provision is only effective in the event the either roommate has a girlfriend. As Leonard has had a few on-again, off-again girlfriends, it was a bit of fun figuring out when this provision was in effect. I didn’t consider Amy to be Sheldon’s girlfriend as the pertinent issues have yet to arise. In season 5, episode 15, Sheldon wins back Leonard’s friendship by amending the agreement to add “Leonard’s Day”. There are a number of “addendums” to various articles. This isn’t something that is directly supported by Akoma Ntoso, so I used the extension facilities of Akoma Ntoso to add generic tags with @name attributes to model the extensions I needed. ← Is it time to rethink how we are governed?